spillyjane knits: Bacon. You heard me! And now for something completely silly: Mittens...with BACON on. Is it veggie bacon or bacon-bacon? It's up to you to decide. 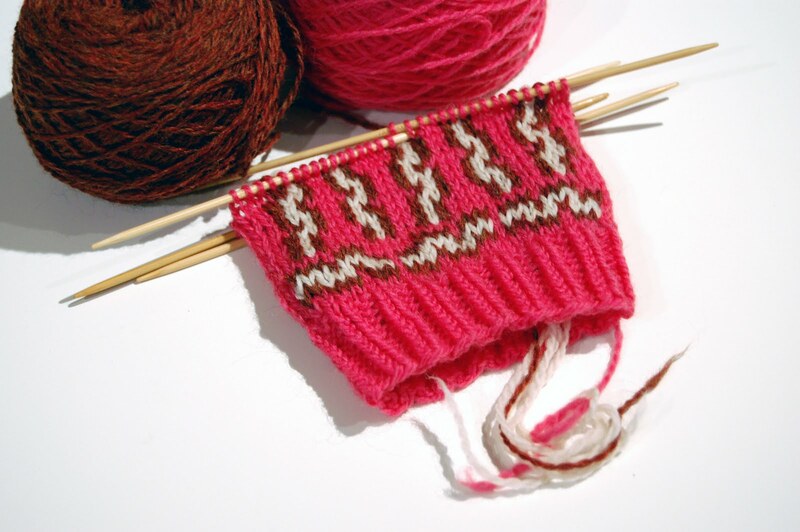 you might finally convince me to make some mittens! February 2, 2011 at 12:04 p.m.
Well sure, why not? Everything is better with bacon! February 2, 2011 at 12:07 p.m.
February 2, 2011 at 12:20 p.m. I've been thinking about when you would make Bacon Mittens!! Honest! February 2, 2011 at 12:24 p.m.
bacon mittens. You are a soooper-genious! February 2, 2011 at 12:41 p.m.
February 2, 2011 at 12:51 p.m. I LOVE them! Can't wait to see! February 2, 2011 at 12:58 p.m.
Would love to make these for my bacon-crazed daughter! February 2, 2011 at 1:04 p.m.
How about some Chocolate covered bacon? February 2, 2011 at 1:40 p.m.
Perhaps it is the winter cold? Hard to say, really. February 2, 2011 at 2:19 p.m. I've never made mittens and I've never done any colorwork either but these might just have to be my first experience. My daughter would absolutely go crazy over these!!!! You are just so funny! February 2, 2011 at 3:01 p.m.
February 2, 2011 at 6:23 p.m.
February 2, 2011 at 6:24 p.m.
February 2, 2011 at 7:12 p.m. Saw your tweet and I admit, you made me look! Can't wait to see them. Someone mentioned chocolate bacon... Had some chocolate bacon fudge recently. It was gooooooood! February 2, 2011 at 7:28 p.m.
February 2, 2011 at 7:59 p.m.
Why not some eggs here and there!!! February 2, 2011 at 8:18 p.m.
February 2, 2011 at 11:35 p.m.
February 3, 2011 at 12:33 a.m.
Wow, links, pints and bacon!! Love! February 3, 2011 at 12:47 a.m.
February 3, 2011 at 9:12 a.m.
can't wait for the bacon mitts (or, more accurately, my daughter can't wait)! February 3, 2011 at 10:02 a.m.
Oh my goodness! Bacon mittens!! You have officially made my day. Awesome. February 3, 2011 at 10:27 a.m.
Those are gorgeous! Do want! February 3, 2011 at 10:33 a.m. Very interesting. I'd love to know how you come up with all of these pattern ideas! February 3, 2011 at 3:47 p.m. In the words of Jim Gaffigan, "Bippety, boppity, BACON!" February 3, 2011 at 10:02 p.m.
February 4, 2011 at 4:21 a.m.
February 4, 2011 at 6:14 a.m. Cool! :D I love silly things! February 4, 2011 at 1:24 p.m.
Perhaps some eggs sunny side up too? February 4, 2011 at 8:50 p.m.
Bacon and beer. It's like you're looking into my soul. What's next...pizza? February 12, 2011 at 5:44 p.m. I'm patiently waiting for this pattern! I hope it's still in the works. April 22, 2011 at 7:11 p.m.